Four down weeks in a row = worst January in decades. Stocks didn't exactly plunge this week but a nice little rally faded away on Thursday and Friday as investors received more bad economic news. Among the items that moved the market the most: consumer confidence hit a record low while continuing claims for jobless benefits hit a record high, new home sales fell to an annual rate that was the lowest since record keeping began in 1963, durable goods numbers were approximately twice as bad as expected, GDP for Q4 of 2008 showed a slowdown of 3.2% but it would have been over 5% if there wasn't such a buildup of unsold inventory. Analysts now expect the current quarter to be even worse as the economy experiences more layoffs and faces working its way through all this inventory before production begins to ramp up. The Federal Open Market Committee met this week but it was a non-event. The bond market didn't even perk up much when the comments about the Fed buying long-term Treasuries. Supply is beginning to become an issue as the government stimulus bill works its way through Congress. Speaking of the stimulus package, it is becoming clear that it will not be a slam dunk and that it won't turn the economy around within the next few months or even within the next six months. And so, pretty much everything served to depress investor sentiment. Despite Amazon blowing past earnings expectations the focus seemed to be on those companies announcing layoffs like Caterpillar, Kodak, Sprint Nextel and GM, for instance. In fact, investors were lucky the market didn't fall more than it did. As mentioned above, stocks didn't plunge this week. According to the statistics collected by the TradeRadar Alert HQ process, some small improvement was actually realized. To my surprise, there were small increases in our moving average indicators. The number of stocks above their 50-day MA and the number of stocks whose 20-day MA is above their 50-day MA both climbed by a bit. Here again we see a bit of improvement despite the drop in major market averages. The number of stocks in down-trends according to Aroon analysis fell noticeably while the number of stocks in up-trends increased slightly. As we've compared our indicators to SPY, the S&P 500 SPDR ETF, it is worth taking a look at its chart. It appears the market is hesitating to make up its mind with respect to where SPY is headed. In last week's post, we drew a downward pointing trend line and a horizontal support line. Support held and SPY broke upward through the downward trend line. This would seem to be very positive for SPY and the market in general. 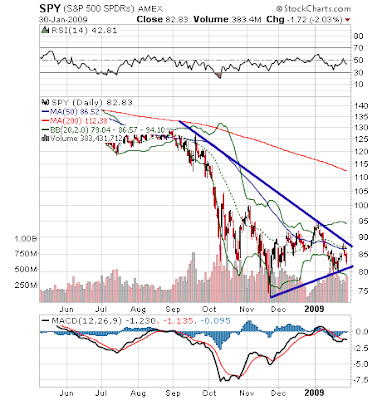 As it turns out, SPY is working its way into the point of the triangle diagrammed in the chart above. Now that SPY has failed to move above both its 20-day MA and 50-day MA, it will be critical that it doesn't fall below the bottom of the triangle. So is the glass half empty or half full? It is a positive that the market didn't end up in worse shape given the depressing nature of the week's economic news. It's notable that our indicators actually registered slightly positive results. On the other hand, stocks generally remain weak and face resistance in the form of moving averages and sentiment. Weighing on sentiment is the growing realization that the government can't immediately solve all our problems even though they are trying. Talk of a plan for a bad-bank/good-bank initially lifted stocks but it wasn't enough to make much of a difference. This coming week, there will be discussion of the stimulus plan in the Senate. I don't expect it to be particularly harmonious. Another potential weight on stocks could be this week's economic reports. There are plenty on the way including personal income and personal spending, ISM manufacturing index, pending home sales, auto and truck sales, ADP employment, ISM services, initial jobless claims, productivity and factory orders, the all-important non-farm payrolls and unemployment rate. And don't forget, we're still in the midst of earnings season. Pretty soon this triangular pattern we're in will resolve itself. I'm hoping it's not to the downside but, as they say, "hope is not a strategy".